The new CNN/ORC poll was released Tuesday morning and directionally it results were similar to the recently released Fox News poll. In other words the bulk of the growth since the Fox news debate was realized by the non-traditional candidates, Trump, Carson and Fiorina. Marco Rubio (+2%) and John Kasich (1%) also grew but at a slower rate than the others. The poll is of registered GOP voters, not likely voters which is important when comparing polls by different organizations. The Rasmussen poll discussed last week which among other things reported a drop in Trump support was of likely voters. Ted Cruz’s results are particularly surprising, because the initial reaction was he had a good debate. 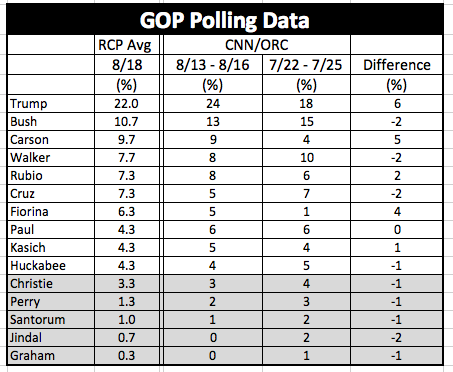 Note in the chart below the candidates who are outside of the top ten (Like Fox News, CNN’s debate on 9/16 will split into two groups top ten and bottom seven). George Pataki and Jim Gilmore did not generate enough interest to register in the CNN poll (perhaps it’s time for them to say goodbye).